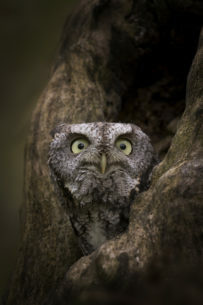 Last fall I was able to spend a few days photographing this Eastern Screech Owl. On one of the days there storm front moving in, and it was putting the tiny Owl on edge. I captured this image just as a gust of wind was blowing and grabbed it's attention.